Over the last couple of weeks we have been hearing about Samsung’s new tablet, the Samsung Galaxy Tab S3 and the device is now official. 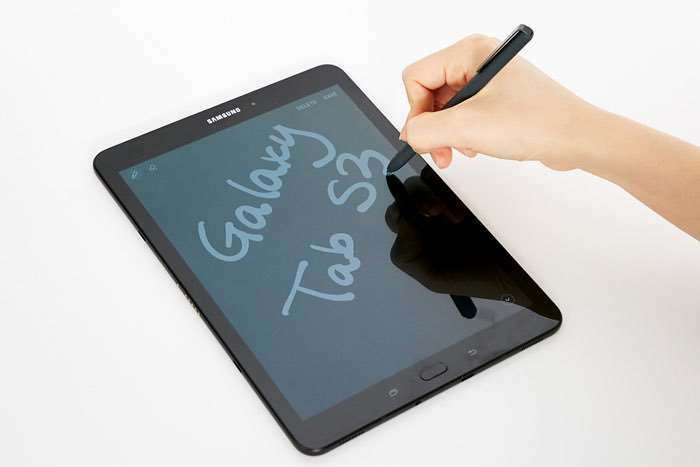 The Samsung Galaxy Tab S3 come with a Samsung S Pen and the tablet features a 9.7 inch Super AMOLED display and the tablet is powered by a Qualcomm Snapdragon 820 processor. The Galaxy Tab S3’s minimal and refined design was achieved by affixing glossy, reinforced glass panels to an aluminum frame, resulting in a seamless aesthetic. The tablet is available in a choice of either understated silver or black, to suit the refined tastes of modern millennials, and its soft-colored cover accessories, available in black, white and green, feature powdery matte finishing to complete the device’s stylish look. Other specifications on the Samsung Galaxy Tab S3 include 4GB of RAM and high end cameras on the front and back. Up front there is a 5 megapixel camera and on the back there is a 13 megapixel camera, the tablet also comes with quad stereo speakers by AKG by Harman. As yet there are no details on pricing or a launch date for the new Galaxy Tab S3 tablet, you can find out more details about the device over at Samsung at the link below.